Picture yourself carelessly twirling around a hauntingly enchanting garden chock-full of miniature tinkering fairies and an opaque flurry of bokeh lights dancing above the river. Dainty, Secret-Garden-esque lavender and baby's breath flowers are intricately braided into your curly tresses reminiscent of Rapunzel (oops, wrong princess movie!) Gold-lamé accents fit for the true royals (think Princess Victoria & not Lorde) flicker throughout your pastel confection of a dress. Even Marie Antoinette will ogle in sheer awe over your saccharine ambiance. Aurora, known for her eponymous moniker as Sleeping Beauty, is as whimsical and light-hearted as the Aurora Borealis itself. In terms of the film, I almost fainted and dozed into a "beauty" sleep coma with the decision to cast Elle Fanning (major girl crush, anyone?) Don't worry, I won't be revealing any scenes or plopping any of those "Disclaimer: Spoiler alerts". 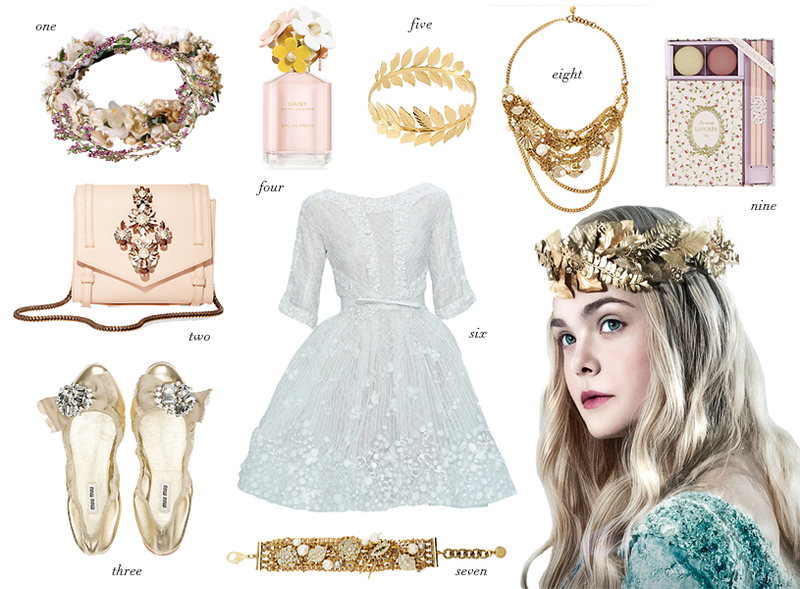 Channel your own princess-inspired ensemble that will make your own Brenton Thwaites (Prince Phillip) swoon. Avoid a chunky gold leaf crown from pinching and poking you and opt for a delicate coronet of blossoming botanicals. Better yet, to add that sugary sweet look, grab a lead bangle to feed your arm candy sweet tooth. Spritz on some of that MJ daisy fragrance as a finishing touch to compliment your frosty and frothy gown. Don't know where to don this charming get-up? Wear it to prom or the next wedding ceremony! Either way, you'll have your own "Happily Ever After" fairytale moment. Just call me you're fairy godmother. Picture yourself magnificently reigning your own kingdom of mysterious creatures while fearlessly battling off an entire empire---nonetheless, that of your ex-boyfriend's (pretty badass, right?). Not only are you 30x bigger, but you also have titanic wings that can forcibly ricochet you up to a bed of clouds as you vehemently look down on the pin-size humans (none of that Disney Tinker Bell cookie-cutter fairy). Enough of my Disney-crazed babblings, let's channel our own inner Joan River--sans the raspy voice & overly snarky commentaries--and get down to sartorial business. Imagine someone prowling around in leather-wrapped Impala/ram horns drowning in a sea of jet-black leather fabrics and a melodramatic cape dragging behind them. Probably a major fashion faux-paus moment, right? To avoid falling victim to such gasp-inducing acts, ditch the efforts to replicate the film's couture-geared fashion and opt for a more street-style look that'll keep you sober from sweats in the sweltering 80-degree summer climate. Don a breathable chiffon maxi skirt with a hint of leather tapered to your waist and a simple yet ultrachic leather strappy top to score major fashion brownie points. Even Rachel Zoe will be eyeing your Athena-inspired gladiator sandals with nature-inspired leaf embellishments. Not to mention your branch-like cuff with flickers of luminous stones as refreshing accouterments to your dark yet sultry ensemble. Rather than uncomfortably placing hazardous antlers fit more for Halloween or for the animal itself, wear a comfy hairband with metallic spikes for some much-needed edge. Want to look edgier? Simply hook on a fringe-like pair of talon-inspired earrings with flowy feathers resonant of Maleficent's batman-esque wings. On a bloodthirsty hunt for a dangerously daring look? Swipe on a crimson red hue for an effortlessly intense look. Easy. Breezy. And oh-so beautiful. Which look is more of your style? I love this! You captured their styles so well! I did a post based on the movie too! BEAUTIFUL looks you created here! Very spot on! Love both outfits that you created! I'm really excited to watch the movie soon. =) Since I'm more on the girly side, Aurora's look is more of my style. Great job on the collages of the movie love it. wow the blue dress is amazing! Amazingggg! I love this post so much and I love the way you wrote this post. o m g this is the best inspo post i've ever seen!! i can't wait for the maleficent movie!! This is awesome! There is definitely a cohesive look to each character which you've captured beautifully. I cannot wait to see the movie. Sleeping Beauty was my favorite movie as a child and Maleficent always scared me to pieces. It will be nice to see her backstory so I can hopefully overcome those childhood fears haha. I watched Maleficent and Angelina's makeup is so stunning and gorgeous! OMG this is so fun! 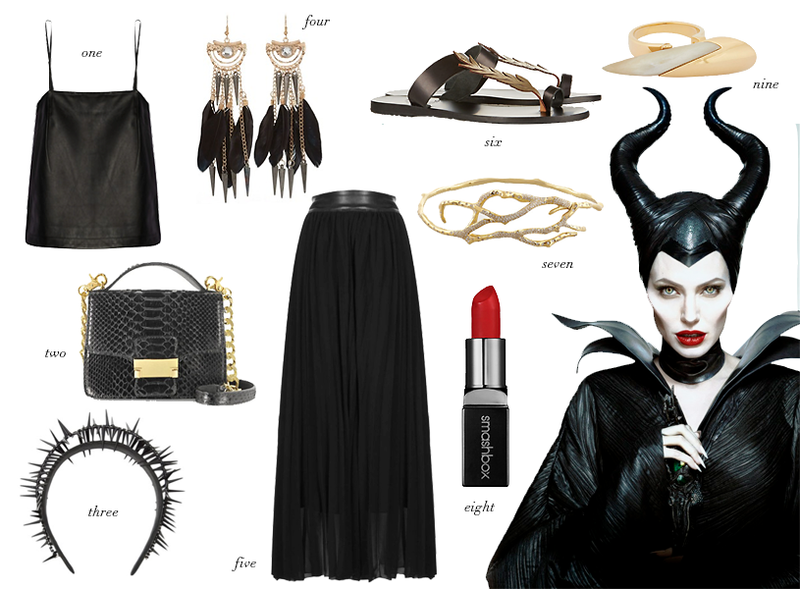 In normal bases I would tell you that I can see my self following the Aurora style guide inspiration because I love pinks, neutrals and soft color palettes but when I saw the one you put together for Maleficent I felt in love with it :) what a great look for a night out! Thanks for sharing darling! Cool piece. That Aurora dress (number 6) is to die for. it is such a lovely idea for a wishlist. Lovely, dear!!! I watched the movie and it was amazing and I really enjoyed your style guide!!!!!! Love everything from both groups!! That thorn headband and floral crown are absolutely stunning. I would so were all of the items. The Aurora is definitely beautiful. such an awesome collage ♥! perfection!!! I would be a super happy girl just by wearing all of these items, or at least just one, it also would make me so glad, ahha.